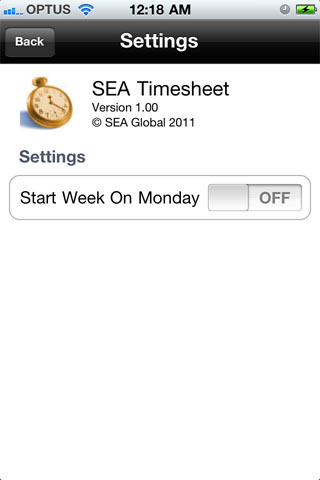 SEA Timesheet - Track time against multiple tasks for multiple clients in an simple to use iPhone interface. Track time against multiple tasks for multiple clients through a simple yet incredibly effective application. Set up one of more clients and then track time against multiple tasks for each client. An unlimited number of clients may be entered and each client can have an unlimited number of tasks. Allows multiple entries for a task per day. That means you can work on something in the morning, then switch to something else and come back to the first thing in the afternoon and enter each block separately. Email your timesheet to yourself for invoicing or send the CSV data directly to your agent. Provides hooks to enable time sheets to be sent directly to your agents billing software in a suitable format. This requires custom development to suit your format. Please contact us for details. Built in timer for timing to the minute. Defaults to Sundays as the start of the week, but also allows for setting Monday as the start of the week. Client: The entity that you wish to bill. Multiple Tasks: Billing method where a client is billed on the basis of a set of tasks. 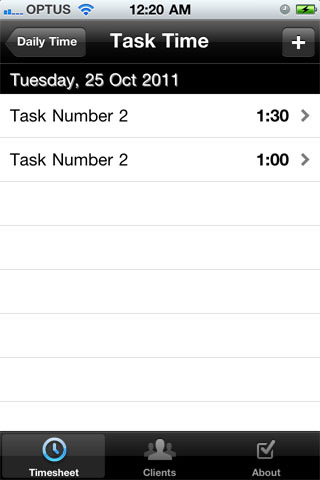 In this billing method you can set up multiple tasks and then assign time at an individual task level. The tasks may be grouped according to Task Groups. Single Task: Billing method where a client is billed on the basis of a single task. All the time for a client is billed against a single task. Task Group: Tasks ara organised into Task Groups, Each Client may then have one or more task groups. Task: The item that time will be associated with for the purpose of billing. Hourly Rate: Billing method where the user selects the start and end time (and breaks if required) for a task to be billed. May be billed to the minute. Timed Rate: Billing method where the user starts a timer to bill against a task. Generally for smaller units of work, may be billed to the second. Multiple Charge Types: A combination of Hourly and Time Rate billing. First, create the clients that you want to bill. Select the Clients button on the toolbar at the bottom. Select the [+] button to add a client or select the client row to edit an existing client. Enter the client details. The Client Code and the Client Name are mandatory fields. The client code and name must be unique in the application. For example, if your client was SEA Global you might use SEA for the code and SEA Global for the client name. Multiple Tasks, Multiple Charge Types. For clients that are to be billed for multiple tasks and may be billed on an hourly basis or a timed basis. This is the default and most flexible option. Multiple Tasks, Hourly Rate. Clients may be billed for multiple tasks on an houly rate basis. Multiple Tasks, Timed Rate. Clients may be billed for multiple tasks on a timed basis. Single Task, Hourly Rate. Clients are billed for a single task on an hourly rate basis. If you wish to email your timesheets directly to the client or to an agency, enter the destination email address into the email field. When you save a new client a Task Group and Task are automatically set up for you to get you started. If you are using the Single Task, Hourly Rate option you are ready to start entering time against the client. If you need to add more tasks or task groups, click the round > button on the right of the client row and the clients list of task groups will be displayed. Task groups are added in a similar manner to clients. You must specify a unique code and unique name for each task group that you wish to enter. When you have finished entering Task Groups for a Client you can add Tasks to the Task Groups. Click the round > button on the task group list to add a task for the group. Tasks are also added in a similar manner to clients. You must specify a unique code and unique name for each task that you wish to enter. When you have finished entering the Tasks for each Task Group you are ready to start entering times! Click the Timesheet button on the toolbar at the bottom of the screen. The timesheet display will show a week summary of the time you have entered. Click the top row to select a Client from the list of clients you have set up in the application. Select the week that you wish to start billing for. Click the day that you wish to enter time against. 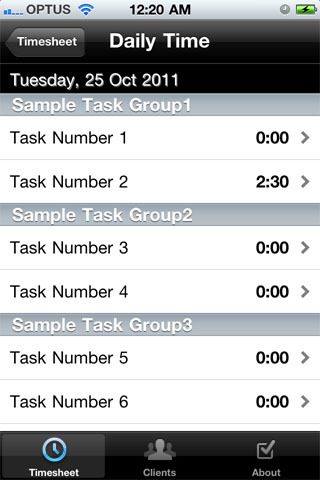 If you selected Multiple Task, you will see the list of Task Groups and the time entered against each Task in the Task Group. Click the Task that you now wish to enter time against. The Time Entry view will then appear. If you selected Single Task the Time Entry view will appear immediately without stopping at the Single Task Group and single Task. 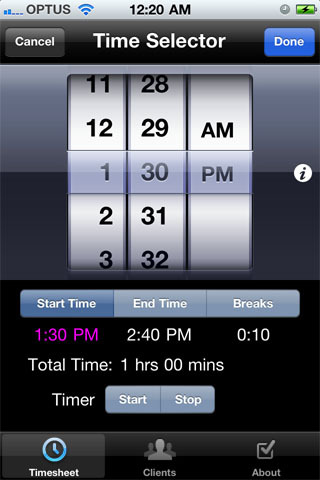 To enter hourly charges, click the [Start Time] button and select the time you started from the Date Picker. 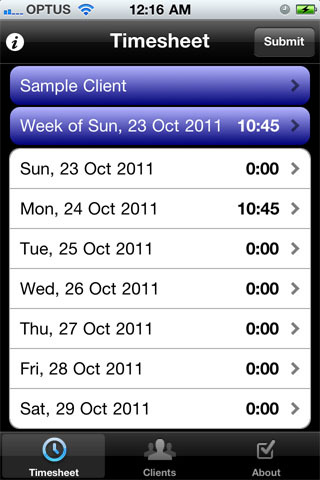 Then select the [End Time] button and select the end time from the Date Picker. 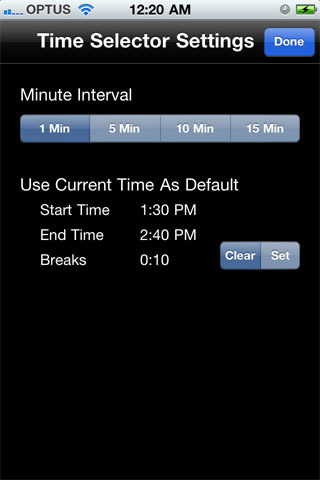 If you need to enter a break, select the [Breaks] button and select the length of minutes for the break from the Date Picker. To enter time via the Timer, simply click the [Start] button and the timer will start. When you are finished, click the [Stop] button. To set up a standard hourly interval or to change the precision on the Date Picker, click the information button on the right hand side of the Date Picker. Click Clear and then Set to set the hourly interval to the previously selected hourly rate interval. Select the appropriate precision for the timer to be one of 1, 5, 10 or 15 minutes. Then Click Done. To Save the Time, click the [Done] button in the top right hand corner.